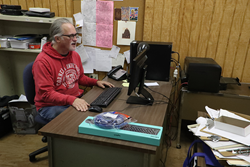 “When we heard about the need for a new computer at All Faiths Pantry, it was a no-brainer for us to donate it to them. We hope it makes a difference in the day-to-day operations of this important organization," said Chief Technology Officer Kathy Golden. OEConnection LLC (OEC), a leading technology employer in Northeast Ohio, donated a computer, as well as the time needed for set-up and installation, to All Faiths Pantry (AFP), a non-profit organization which delivers nutritious groceries to local low-income seniors and those with physical disabilities. The organization has been using a refurbished computer for years, and frequently experienced issues with insufficient computer memory, making even simple tasks, such as printing a document, very time-consuming. AFP Board Member, OEC Enterprise Director Sarah Truman, noticed the outdated technology and decided to help. OEC associates Brandt Ward and Steve Yontz, who work in the company’s IT Operations department, set up the new computer at AFP, using company-paid volunteer hours to do so. To learn more about All Faiths Pantry, visit their website at allfaithspantry.org. OEConnection (OEC) is the leading automotive technology provider for OEM distribution networks, enabling automakers and dealerships around the world to deliver parts and service information quickly and accurately into the hands of repairers in collision, fleet, mechanical and retail segments, as well as their own service lanes, through a suite of parts cataloging, supply chain, pricing, ecommerce, service and business intelligence solutions. OEC serves nearly 50 international auto brands and fleet companies, and more than 120,000 dealership and repair customers worldwide. OEC is headquartered in the greater Cleveland area at 4205 Highlander Parkway, Richfield, Ohio, USA, 44286. Additional information is available at http://www.oeconnection.com or by emailing Geo Money at Geo.Money(at)oeconnection(dot)com.